In magic, the hand might be quicker than the eye. In football, it better not be, especially when it comes to an empty hand and the officials’ eyes. The play in question came in the "win-or-out" playoff-type game between Green Bay at Chicago Sunday. Here was the situation: Green Bay had the ball, first-and-10 at the Chicago 17-yard-line with 3:35 left in the second quarter. Chicago led 7-3. 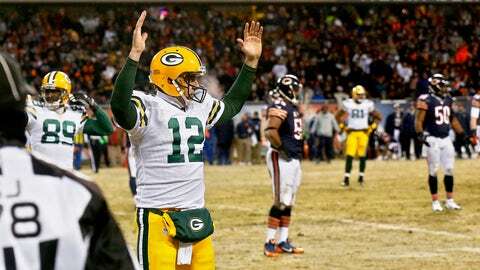 Packers quarterback Aaron Rodgers got the ball in the shotgun formation and as he was attempting to pass the ball, was hit from behind by Bears defensive end Julius Peppers. It was obvious that the players on the field initially thought the ball was an incomplete pass because everybody stopped. But Jarrett Boykin eventually picked the ball up and ran it into the end zone to give the Packers a 10-7 lead. We’re often quick to criticize officials, but sometimes slow to compliment them. On this play, the officials deserve a lot of compliments. The first one goes to referee Clete Blakeman, who has had his struggles this year, but immediately ruled a fumble on the play. And it was the correct call. Contact from Peppers came from behind, which knocked the ball loose in Rodgers’ hand before the hand started forward. The ball, and then the contact combined with the hand motion, made the ball go forward about 8-10 yards. The second part of the play the officials handled perfectly, was that they did not blow the whistle downfield, even though the ball ended up going downfield. They held off their whistles even as the ball rolled dead, which in this case, was eventually picked up by Boykin who ran it 15 yards into the end zone. More often than not, I see downfield officials killing the play when the ball comes downfield like that. I know a lot of people in Chicago weren’t happy with the call, but it was the correct call.